If you love Mexican food and find yourself in Sausalito, you must check out Copita Tequilaria y Comida. They serve very fresh, seasonally-inspired menu that also happens to be totally gluten-free (to be sure, check the bottom right of the menu for the magic words “Today’s menu is gluten-free” or ask your server). My first visit, I fell hard for their pork al pastor tacos with spit-roasted pineapple and they’ve been on my mind ever since. Happily, these healthy, flavorful tacos are incredibly easy to re-create at home! In a 1-gallon zip-top bag, combine chipotle through salt; squish bag until mixed. Add pork and shake/squish until the slices are evenly coated. Seal bag and refrigerate for at least 2 hours or up to 1 day. Remove pork from fridge about 30 minutes before cooking and preheat the oven to 350°F. Wrap the stack of 8 tortillas with aluminum foil; place in preheated oven. Set a lightly greased (with olive oil) 10″ cast-iron skillet over high heat just until it begins to smoke. Add all of the pork to the pan, patting out to create an evenly thick layer. Cook the first side for about 2 minutes or until the meat is be nicely browned and somewhat crisp, then flip to cook the second side until the meat is browned and reaches at least 145°F (about 2 – 3 minutes more). Remove pork to a heatproof plate, tent with aluminum foil; set aside. Carefully rinse out and dry cast iron pan (or use a clean pan). Set over high heat and lightly grease. Once pan is hot, toss in cubed pineapple and cook, turning once or twice, until caramelized on a couple sides (about 5 minutes). Remove pan from heat. Roughly chop pork into bite-size pieces. 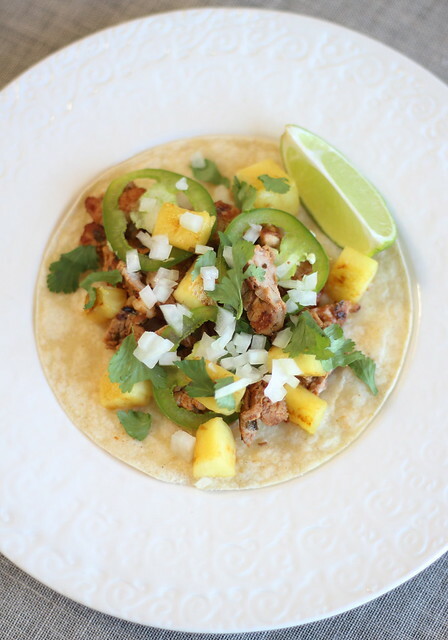 Divide pork and pineapple amongst the hot tortillas. Top with minced onions and cilantro to taste and 3 thin slices jalapeño. Serve immediately with lime wedges. ¹ Soak pepper in boiling water for about 30 minutes to rehydrate (you may need to weight pepper down with a spoon to keep it from floating). For a not-so-hot pork filling, seed and remove ribs from pepper before mincing into a paste.